With a need to rapidly deliver new services, cope with massive data growth, and contain costs, cloud service providers and hosters seek increasingly efficient ways to handle the demands on... their infrastructure. Today’s servers based on Intel® Xeon® processors provide leadership performance and performance per watt with the flexibility to handle a wide range of workloads and peak demands. However, certain lightweight, scale-out workloads—such as basic dedicated hosting, low-end static web serving, and simple content delivery can sometimes be hosted more efficiently on larger numbers of smaller servers built for extreme power efficiency. To address this need, Intel worked with a broad ecosystem of leading server manufacturers to develop and deliver a variety of extreme low-power systems to support an emerging server category—microservers. With up to 1,000 nodes per rack and shared power, cooling, and networking resources, microservers can help you improve data center efficiency by right-sizing infrastructure for relatively light processing requirements. 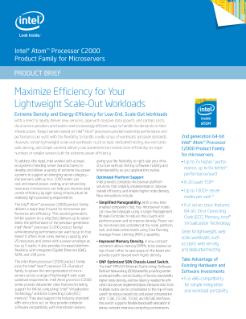 Read the full Intel Atom® Processor C2000 for Microserver Performance Product Brief.